Cooler Master first unveiled the MM830 Gaming Mouse at CES 2018, hoping for a summer 2018 launch ahead of the autumn crush of Triple-A games. Sadly that was not to be, but fans of Cooler Master peripherals or MMO gaming in general will be pleased to know that the mouse can be in their hands very soon indeed. The MM830 is the second product within Cooler Master's M800 peripheral series, joining the MP860 dual-sided RGB gaming mousepad. You can read our review of the MP860 here. 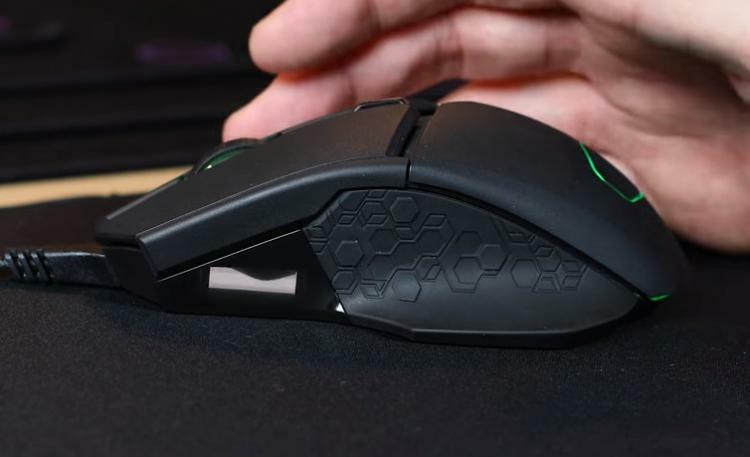 As a mouse the MM830 is of course quite a different beast, but the ample RGB lighting across both devices serve as a thematic link that will no doubt strengthen as more M800-series products are released in the future. Context provided, the technical specs should be useful. The key to any good gaming mouse is the sensor, and the MM830 is well equipped with cutting-edge PixArt 3360 sensor capable of up to 24,000 dpi (though questions remain over whether this is native or via interpolation). Switches are manufactured by the ever-reliable Omron, rated for up to 20m clicks each. The weight is a fairly hefty 162g, emphasising its suitability for MMOs as opposed to FPS gaming. The mouse's party trick rests on the thumb pad, and it's quite hard to spot. Four dimples on the matrix pattern are in fact four switches, actuated by rocking the thumb up/down and left/right. Responsiveness should be swift, and four buttons is usually plenty for all but the hardest of hard-core spellcasting keybind setups. That aside, there's still more to the MM830. We've mentioned the customisable RGB lighting - present in four discrete zones across the mouse - but an additional consideration is the small OLED screen resting in front of the thumb pad. This can be configured to display a wide selection of metrics and messages, and in the future could become exceptionally flexible. This USB mouse is scheduled to launch in the EU and US regions today, priced at an MSRP of €79.99 incl V.A.T. or $79.99 excl. tax respectively. For more information on this and the rest of Cooler Master's peripheral range visit CoolerMaster.com.